The Bible is the greatest book ever written, thousands of years old, yet fresh and alive as the morning news. Indeed some of it is the morning news right now. The land of the Hebrews (Israel) is always a hot topic any day. When God called Abraham he made him a promise that his offspring would be innumerable, and that all nations through him would be blessed. Well, what is that blessing that God promised? Jesus, God in the flesh, and the things that pertain to Jesus. The innumerable offspring: the Jews. And in the future? Food – Israel is right now producing some of the best citrus to be had anywhere. Oil – a deposit of oil estimated at seven million barrels near the Dead Sea and within the boundaries of Israel was in the news in 2016. There is also oil in the Golan Heights. Who knows what may yet be discovered. God said it was a good land, flowing with milk and honey was the way it was described. His word is true, right down to the last jot and tittle. Nowadays almost everyone believes in the supernatural – spirits, ghosts, extra-terrestrials, bigfoot, angels, demons, fairies – the list could get to be quite long. But those same people have difficulty believing that the father of Jesus was not Joseph, but God himself. And that Mary was a virgin until she gave birth to the son of God. The Gospel of Matthew gives two geneaologies for Jesus. One comes down to Joseph, who was the legal father; the other comes down to Mary, the mother. Jesus was a descendant of Abraham. He is the redeemer promised to fallen man, exiles from the garden of Eden, and to their posterity. Jesus is/was a Jew, a Hebrew. When God announced the tenth plague – the death of the firstborn – the Hebrews were instructed to kill an unblemished lamb and to apply its blood to the doors of their houses. By so doing they were to be spared and none of their firstborn would die when God passed through the land on that fateful night. The lamb was to be eaten that evening and its remains burned in the fire. Here is the origin of the Jewish Passover. Here also is a picture of Christ, bleeding on the cross, the sinless lamb, sacrificed that we might live and not die. But, like the Hebrews, we must eat the lamb. People get offended when they hear that. Some of Jesus’ disciples left him when he said they must eat his flesh and drink his blood. Of course, he did not mean that literally. Just goes to show you how shallow their thinking was. Jesus meant they must commune with him, stay with him long enough to learn something, become educated in the ways of God. If you love him you will want to do that. Moses was their leader, but it was God who led the Hebrews on their journey to the promised land. They followed a supernatural pillar of cloud in the day and a pillar of fire by night. When these moved the people followed; and when they stayed, the people stayed. Their first camp was at Succoth. From there God led them through the wilderness to the Red Sea. Meanwhile, Pharoah had changed his mind again, and the Egyptians set out in pursuit of the Hebrews. They hemmed them in at the edge of the Red Sea, but then God moved the supernatural cloud between the Hebrews and their pursuers while he opened the Red Sea with a strong wind. Through a trough between the waters the Hebrews passed to the other side. And just in time, for the Egyptians followed close on them in the trough of dry ground. When the last of the Hebrews had crossed God quickly closed the waters and drowned the entire army of the Egyptians. These posts would be way too long if we covered all the things that the Bible tells us about what happened to the Hebrews and what they did and how they lived. It is a fascinating story recorded in the first five books of the Bible. Basically, God paved the way for these his chosen people. He provided food for their journey which he spread upon the ground every day but the Sabbath for forty years. 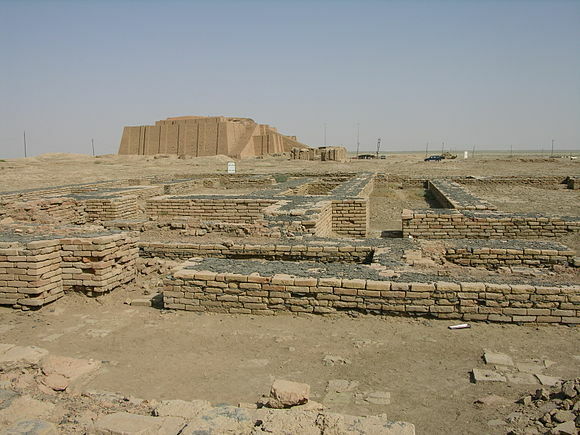 He provided water in the desert, first by cleansing the bitter waters at Marah and soon afterwards by bringing forth water from a rock at Horeb when there was no water for the people at their camp at Rephidim. When the Amalekites attacked them at Rephidim they were defeated with supernatural help from God. Moses stood on a mountain overlooking the battle and as long as he held up his hands the Hebrews prevailed, but when he let them down the Amalekites prevailed. When Moses grew too tired to hold up his hands, Aaron and Hur held them up and at the end of the day the Amalekites were defeated. The Biblical record shows that during the entirety of their journey their clothes and shoes did wear out. In short, God provided for their needs. Their wants got them into trouble with God, as we shall see. 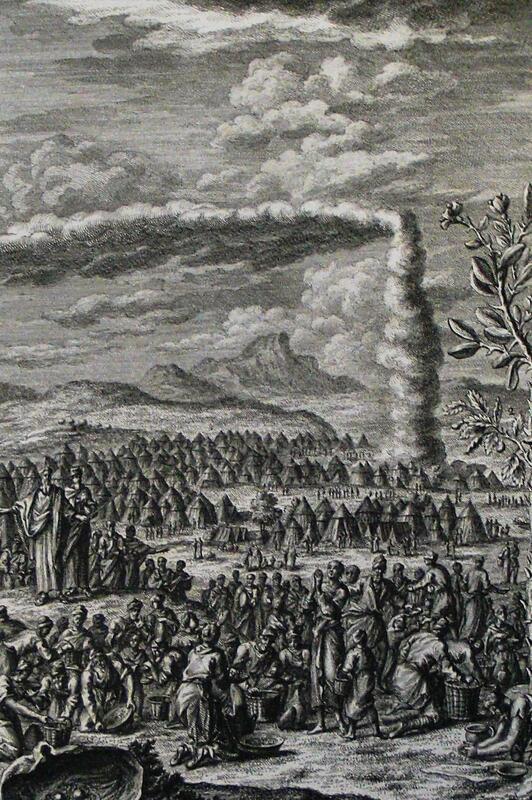 Three months into their journey, the Hebrews were encamped on the east side of Mt. Sinai, the place where the ten commandments were given. God told Moses to tell the people to keep away and to keep their cattle away from the mountain. Then God came down upon the top of Mt. 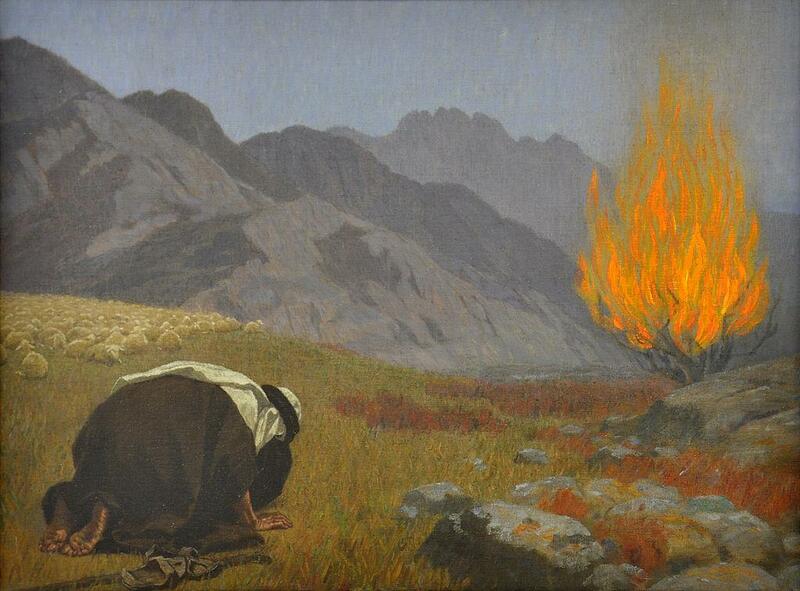 Sinai in a fire and smoke, lightning and thunder. The sound of a trumpet was heard and the mountain shook and trembled. The people were very fearful and said to Moses, Speak thou with us, and we will hear, but let not God speak with us, lest we die. (Exodus 20:19) Moses calmed their fears, then he left them and went up on the mountain with God. The top of this mountain (Jabel el Laws in Saudi Arabia) is blackened from burning to this day. Regarding Mt. Sinai, the traditional site at St. Catherine’s Monastery in the Egyptian peninsula (also named Sinai) looses all credibility, when compared to recent historic and archaelogical findings at Jabel el laws in Saudi Arabia. The Hebrew people were slow learners, so much so that today we just shake our heads at the things they did and wonder how they could be so dumb, and how they underestimated God. This is still happening today, and not just among the Jews. While Moses was up on the mountain with God he left Aaron, his brother and second in command, in charge of things. Days drew into weeks, and the Hebrews got restless. They decided Moses wasn’t coming back and they could do as they pleased. In short order they had enlisted Aaron’s help in making unto themselves a golden calf which they worshipped and frolicked around naked. The Bible doesn’t say what else they did, as they addressed the golden calf saying, These be the gods that brought us up from Egypt. (Exodus 32: 8 paraphrased) They picked the wrong time for their party, because as they were singing and dancing around the image of the calf, Moses returned from 40 days of communing with God. Uh oh! In his great anger Moses cast down and broke two stone tablets he was carrying whereon God had written the ten commandments. His people had already broken the first commandment worshiping an image! When Moses confronted Aaron about it, Aaron gave the lamest excuse possible saying, Now, don’t get mad. You know these people are always into mischief. You were gone so long they didn’t think you were ever coming back so they asked me to make gods to lead them. They gave me their gold jewelry and I threw it into the fire and out came this calf. (Exodus 32:22-24 paraphrased) At Moses’ commandment, more than 3,000 men were killed that day for the sin of idol worship. The Bible doesn’t tell us what Aaron’s punishment was, or if he was punished separately at that time, or at all. Moses said later on that he prayed for Aaron at that time. So, lest we presume to read the Almighty’s thoughts and to know his motives let us forebear to criticize him. For he is just to the nth degree. He simply doesn’t tell us everything. The Bible says the Lord plagued the people for this sin. He threatened to “consume” them, but Moses interceded for them and God relented in his judgement. 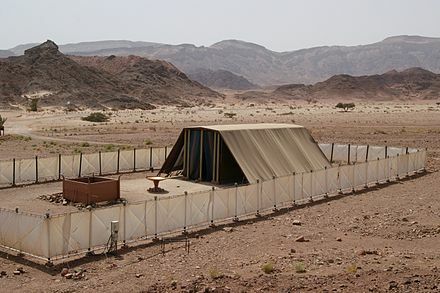 The Hebrews camped in Sinai about a year before continuing on to the promised land. At Sinai God gave Moses laws and regulations covering almost every aspect of living, right down to cleanliness and food preparation. He also gave him detailed plans for a portable temple, including all the furnishings and instruments for sacrifice and worship, including the ark of the covenant, which was a large box overlaid and decorated with gold. This portable temple is spoken of today as the Tabernacle in the Wilderness. This was not a simple tent; it was a work of art and craftsmanship, as anyone who has read the book of Exodus can tell you. When it was completed and set up the pillar of cloud and fire came and rested upon it thereafter. 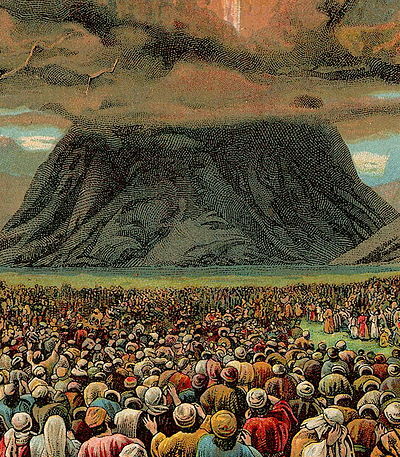 Eventually the pillar of cloud lifted and the Hebrews continued their journey toward the promised land. One might wonder why it was taking so long for this trip. 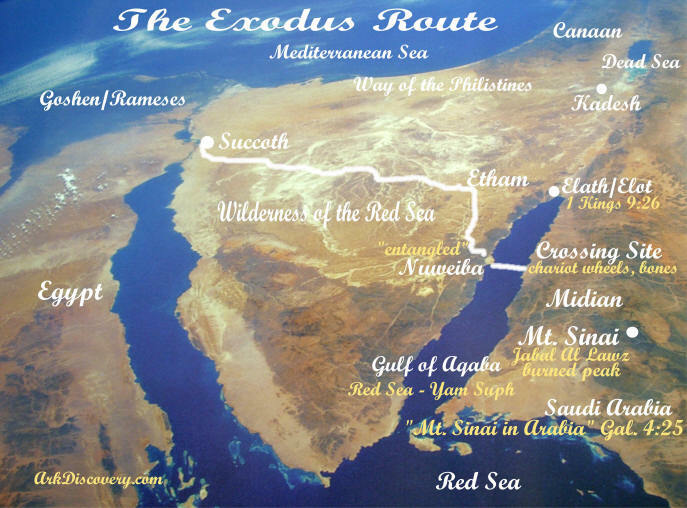 Going the short way one could get from Egypt to Canaan in about eleven days. God gave one of his reasons: he didn’t want the Hebrews to travel the short route because it led through the land of the Philistines. He believed they would become discouraged and return to Egypt since they would have to fight the Philistines. (Exodus 13:17) Well, many times, especially at the first when they were hungry or thirsty, they murmured and complained and wished out loud that they were back in Egypt. So, God was right in his assessment of them. Next time we will travel to Kadesh, on the border of the promised land and find out what happened after that.